The coat of arms of Guanajuato appears in the centre of this coin and the name of the state, "GUANAJUATO”, is underneath. A statue of Miguel Hidalgo, father of the nation, is on the left; the Pipila monument is on the bottom right and part of the Juárez theatre can be seen in the background. 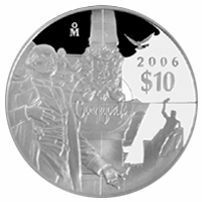 The mintmark of the coin of Mexico is above it. The dove of peace is on the top right with the number “2006”, the Pesos symbol “$” and the number “10” underneath.